There is a growing interest in identifying the members of microbiota that provide beneficial health effects. In this context, microbes that promote a healthy gut function are in the spotlight for inflammatory bowel disease (IBD) research, since IBD patients suffer from dysbiosis. Given the underlying reason for IBD is still not known and there is a risk in introducing probiotics in patients where the gut barrier is broken, we wanted to take a different approach and identify bacterial components that drive a healthy intestinal environment. Our earlier studies pointed to a component known as curli, an amyloid protein with conserved beta-sheet structure fibers that are expressed in the biofilms of enteric bacteria. These studies determined that curli fibers are recognized by Toll-like receptor 2. Intriguingly, we also determined that recognition of curli by TLR2 leads to a decrease in barrier permeability and bacterial translocation in the gut. In the current study, we wanted to test whether purified curli could dampen inflammation and reinforce the intestinal barrier during colitis. We chose a mouse model, TNBS-induced colitis, that is used for IBD. We treated the mice orally with a single-dose of purified curli one day after TNBS treatment. To our surprise, this single treatment was powerful enough to dampen inflammation close to the levels observed by the standard IBD treatment used for humans. Furthermore, we determined that the protective effect of curli was driven by TLR2, which elicited an anti-inflammatory IL-10 immune response. The TNBS-induced colitis model requires the administration of TNBS as enema, therefore no-one was initially too fond of performing this model! But everyone did a wonderful job, especially Gertrude Oppong, even though this was the first time we used this model in our laboratory. We determined that bacterial components recognized by the immune system that trigger beneficial effects such as promoting homeostasis could potentially be used to treat dysbiosis or inflammatory conditions in gut. Next, we need to test the curli treatment in IBD patients. We have already started a collaboration with the IBD center at Temple University to move this forward. What are the main reasons you chose to publish in an open access journal? I thought the scope of the journal was a great fit for our study. Also the editorial team is outstanding. Earlier studies on curli were conducted by Dr. Normark, who is the Editor-in-Chief of npj Biofilms and Microbiomes. It was exciting for me to interact with him during the publication process. I read all his papers in my early career. It was a plus that the journal is open access. This way, our study reaches a broad audience. I received many emails from IBD patients, showing that they were able to access this research study, which was interesting for them. 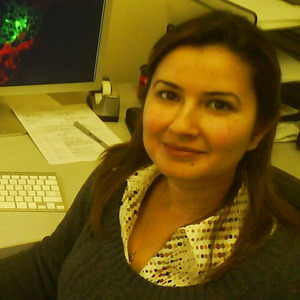 My research focuses on how the bacterial biofilm are recognized by the immune system. We are mainly interested in bacterial amyloids, protein deposits with a fibrillar cross beta-sheet quaternary structure, which exhibit a starch (amylose)-like ability to stain with iodine. In humans, deposition of various amyloid proteins is associated with a number of illnesses, such as Alzheimer’s disease, Parkinson's disease, prion diseases, and type-2 diabetes. Interestingly, many bacteria produce functional amyloid deposits, which are an important component of their extracellular biofilm matrix. Curli amyloid fibrils, produced by enteric bacteria such as Salmonella enterica serotype Typhimurium and E. coli, are the best-characterized bacterial amyloid fibrils to date. Amyloids of both host and bacterial origin share a number of characteristics, including an ability to trigger innate immune responses. Recently, we discovered that responses to host amyloids and curli amyloid fibrils are mediated through Toll-like receptor (TLR) 2. Currently, we are working on the immune recognition of curli fibers in the intestinal tract and at systemic sites.